As the number GSHP installations have increased throughout the United States, so have the options for installing a ground loop. The options are especially bountiful in many rural settings, where ample space allows for tailoring installations to local geology, ground cover, and required heating/cooling production. There are three general types of ground loops: closed, open, and hybrid. When horizontal trenches are either infeasible (e.g., inadequate space) or not preferred (e.g., mature landscaping), vertical wells can be drilled. Boreholes are typically drilled to around 100 to 400 feet deep (depending on local geologic conditions). With a u-bend at the bottom of the hole, fluid is circulated in the pipe from the surface to the bottom and back to the surface, transferring heat energy between the fluid and the earth. The surface area required is considerably less than for a horizontal ground loop, and there is more flexibility with the surface covering. 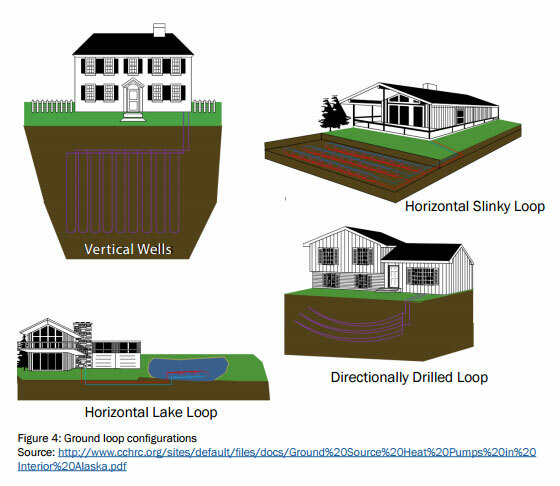 For instance, vertical wells can be drilled beneath an existing parking lot or mature landscaping.Another closed ground loop option involves placing the loop coils in a body of water, such as a pond, lake, or even an ocean. Water provides an excellent heat conduction medium for the piping, but this option presupposes a nearby body of water that does not freeze solid in the winter. In the rare conditions where available, a loop in water is often the most economical design option. The most recent innovation in closed ground loop designs uses horizontal directional drilling. This configuration layout consists of straight horizontal pipes installed by using a directional drilling machine rather than excavation equipment. There is minimal disturbance to the surface landscaping. To install a directionally drilled ground loop, header and footer trenches are dug to connect the pipes, and then a drill is used to install underground pipes in a shallow arc between the two trenches. Open-loop systems pull water directly from a well or surface water, circulates through the heat pump, and then discharges it. Open-loop systems can often be less expensive to install than closed-loop systems, as they require less pipe and excavation; however, local, state, and federal regulations regarding groundwater discharge must be met. Water quality (e.g., hardness and mineral content), seasonal water temperature, and variations in the flow must also be considered. A hybrid GSHP system combines the ground loop with another combines the ground loop with another technology for space conditioning. For heating-dominated systems, the ground loop can be combined with solar thermal collectors, which can provide direct space heating or can recharge the soil around the ground loop with heat. In a coolingdominated climate, the ground loop might be combined with a cooling tower or cooling pond for additional heat rejection. A GSHP could also be coupled with a conventional system, such as electric resistance heat or boilers, to provide space heating. There are several considerations when looking into a GSHP system. First, consider the heating/cooling delivery mechanism in the building. Is warm air blown in through ducts, or does it come from hot water? The mechanism of delivery is important because a GSHP is most efficient at lower delivery temperatures. For example, forced air and infloor radiant heating are typically compatible with a GSHP, as they require fluid temperatures under 110 °F degrees; however, hot water baseboard systems require temperatures between 120°F to 180°F and are thus generally not compatible with a GSHP. characteristics, land area, tree cover, and water table depth affect what type of drill can be used and how well heat is conducted between the ground and loops. Another consideration is how the ground loop will be recharged with heat. In heating-dominated climates, there is potential to extract more heat energy from the ground in winter than is returned in summer, thereby depleting the heat source. Using a GSHP for cooling in summer will return some heat to the ground, but the rejected heat may not be enough to fully “recharge” the heat source. The summer sun also helps recharge the ground, so a horizontal loop should ideally be in a location with limited shading. Additionally, in winter, snow pack on top of a ground loop will reduce heat loss, as snow helps insulate the ground from cold winter air temperatures. Depending on the type of ground loop installed, permits may be required from municipalities, counties, or states. In general, closed loop systems do not require significant permitting, although a loop field placed in a body of water often requires a permit; additionally, an open loop system can require state and federal permits. Local installers should be well-versed in permitting requirements.